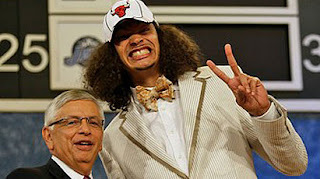 So the Bulls drafted this guy. A lifelong Knicks fan who admits, "I hate Michael Jordan", and whose jump shot resembles Dennis Rodman's. I suppose he brings the requisite hustle, passion, scrappiness and other intangibles that "don't show up on the statsheet". But why, oh why do the Bulls continue to draft players from college teams that I abhor? (Florida, Duke, Kansas, etc) I guess I'm OK with it as long as he turns out to be a poor man's Ben Wallace, aka Tyson Chandler, who we just traded last year precisely because he shared all of Noah's weaknesses. Better than that Spencer Hawes guy I guess. An average white center (he's a great passer!) with little upside excites me about as much as Kirstie Alley in a bikini. *I'm sure you can just go to Page 2 if you really want to find out.